Looking for a location to hold your next murder mystery? 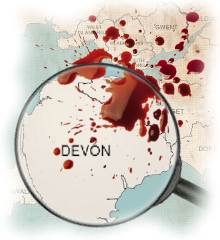 We've run murder mysteries in almost every county in the United Kingdom. The following are just a selection of places where we have worked, along with some suggestions of suitable venues. Here at The Murder Mystery Company we love working in Bedfordshire. It’s full of pleasant countryside, stately homes, ancient woodlands and pretty villages. There is also many a spooky tale involving this home county; making it a superb location for one of our spine chilling murder mystery events. Located in Southern England and often referred to as the Royal County, Berkshire is perfect for an intriguing murder mystery evening. The county is famous for Eton College, horse racing at Royal Ascot and most famously its Castle at Windsor - where better to take part in our gripping murder mystery Who Killed His Lordship. A county full of history and heritage, Cambridgeshire is a great location for a fantastic murder mystery event. Located in the East of England and home to the famous Cambridge University, this celebrated county has seen many of our exciting murder mystery nights! The rolling hills of the Welsh Marches, lush sweeping green valleys, iconic black and white ‘Magpie’ houses... this can only be Cheshire. A stone’s throw from both Liverpool and Manchester, this North Western ceremonial County is a stunning murder mystery location. This warm and welcoming county is situated in the centre of England’s beautiful West country. Overflowing with character, Devon is steeped in history and surrounded by a stunning mix of landscapes including spectacular cliffs, golden sandy beaches and wild moorlands. A quintessential English county, Dorset is sprinkled with charming villages, colourful heathlands, tranquil river valleys and a stunning rugged chalk-cliffed coast. Situated in the South West, Dorset has over 200 million years of history and is home to England’s first natural World Heritage site, the Jurassic Coast. Prepare yourself and your guests for a gripping murder mystery event in Essex! Located in the the East of England and home to spooky Epping Forest, the county boasts the longest coastline in Britain and the worlds longest pleasure pier. Created in 1965, Greater London is one of the 48 ceremonial counties of England and is made up of 32 boroughs and The City of London. Archaically the area was known as the Metropolis and we just love the variety of locations to run great murder mysteries in! Mighty contender to the title of “Second City”, Greater Manchester sits proudly at the heart of North West England. An ideal setting for one of our intriguing murder mystery nights, the Mancunian scenery blends beautiful countryside, including the Peak District, with industrial landmarks and Roman history. Get ready for a truly thrilling murder mystery event in Hampshire! This Southern ceremonial County is famed as home of such greats as Jane Austen, Charles Dickens and Isambard Kingdom Brunel and has played host to many of our murder mystery evenings and days over the years. The Home County of Hertfordshire is situated just north of London with the M25 motorway crossing the border. This ideal location ensures the county as the perfect destination for a sensational murder mystery event. Often referred to as the Garden of England due to its abundance of orchards and hop gardens, the beautiful region of Kent is ready and waiting to host your next fun filled murder mystery evening! Only 35 minutes from London and with strong connections into Europe, the oldest county in England is the perfect location for a murder mystery night. This landlocked gem at the heart of England is easily accessible from all parts of the country and is idyllically set amongst the charming rolling hills of the East Midlands. Its proud capital Leicester is one of England’s oldest cities and ancient Roman pavements and baths speak of its early origins and uncovered treasures. A murder mystery night in Merseyside is certain to be a thrilling experience... The county can be found in the heart of England’s North West and borders Lancashire and Greater Manchester. Famous as the birth place of the Beatles, the county also boasts two premiership football clubs and the 2008 European capital of culture, Liverpool! The magnificent county of Nottinghamshire is situated in the heart of England. Most famous for Sherwood Forest and the legends of outlaw hero Robin Hood, Nottinghamshire has played host to many of our captivating murder mystery events. The most rural county in the South East of England, Oxfordshire offers a vibrant culture, rich heritage, a bustling array of rural and urban towns and villages. The ideal location for a fabulous murder mystery night, Oxfordshire is situated in rural South East England with no less than seventy percent of the county designated as an Area of Outstanding Natural Beauty! Sprawling across the northern third of the island of Great Britain, Scotland was named the “Land of the Gaels” by the Romans and though small, the country offers an amazing range of landscapes. The gentle rolling hills of Dumfries and Galloway grow into breathtaking peaks in the Cairngorms providing a breathtaking and mysterious setting for your murder mystery party. A landlocked gem in the West Midlands, Staffordshire is truly surprising. Towering cliffs in the Peak District, cool and leafy woodlands with free roaming monkeys and beautiful heather heathlands unspoilt for hundreds of years at Cannock Chase. Amongst a delightful array of towns and villages lies Lichfield where the Staffordshire Hoard was discovered, the most important collection of Anglo-Saxon objects in the whole of England. A murder mystery event in Surrey is guaranteed to be a memorable experience! A relatively small county, Surrey is just south of London making it a great alternative destination to the capital. Surrey is England’s most wooded county, with rolling hills and unspoilt countryside creating a true rural feel. Situated in the South East of England is the splendid county of Sussex. Divided into East and West, the region has plenty of fantastic locations ready to hold your next murder mystery event. 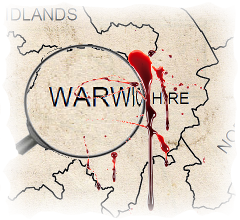 A murder mystery event in Warwickshire is guaranteed to please! Shakespeare’s county in the heart of England lends itself well to our fabulous array of murder mystery nights. With it’s ancient half-timbered buildings and a feeling of ‘Olde England’, the county offers exciting locations such as Rugby, Warwick, Stratford Upon Avon and Royal Leamington Spa; all capable of hosting an intriguing murder mystery to remember. With high, rugged mountains, shores steeped in the frothy waters of the Atlantic Ocean and the Irish Sea, Wales is one of the most scenic of the old Celtic nations in Europe. Its brooding climate and its iconic mythical tales of Dragons envelop the country in an air of mystery ideal for our murder mystery events. A true metropolitan county in western central England, home to the cities of Birmingham, Wolverhampton, and Coventry, the West Midlands have been at the heart of commercial and industrial development in the British isles. The largest of England’s 39 historic counties, Yorkshire is one of the most scenic and fascinating places in this Great Britain. Its beautiful and mysterious countryside has acquired the common nickname of “God’s Own Country” throughout the ages and the rich culture of its cities has drawn magical tales from the pens of many a writers and poets making it a great murder mystery destination.